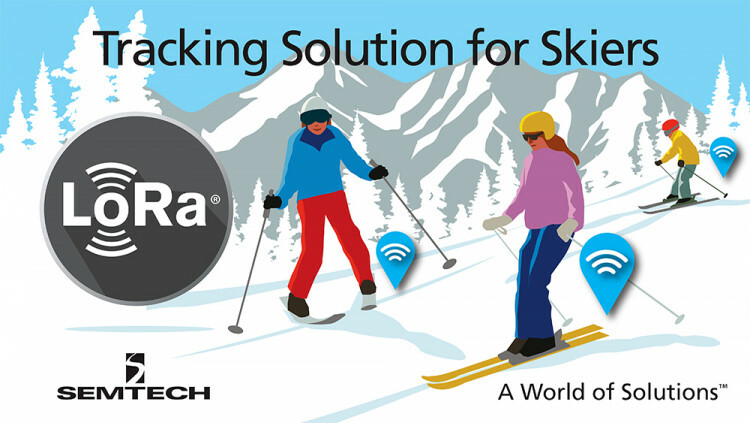 Semtech Corporation (Nasdaq: SMTC), a leading supplier of analog and mixed-signal semiconductors, today announced that after a successful trial, TalkPool and Wuerth ITensis will be deploying a ski tracker solution using Semtech LoRa® Wireless RF technology to monitor skiing students on the slopes of the Swiss Alps in the upcoming 2016/17 ski season. A LoRaWAN™ low power, wide area network (LPWAN), comprised of base stations and sensors embedded with Semtech LoRa technology, is the key component to this new tracking solution. Each student who takes a lesson at the LAAX resort in Switzerland will be equipped with a sensor module that transmits the student’s location to the network via a gateway. All instructors will be able to tap into this information using an app on their smartphone. The app will provide instructors with visual cues they can follow on an interactive map. For example, a green dot displays for students who are close by, while a red dot indicates students who might be lost, allowing the instructor to locate them quickly. “The large amount of data must be stored safely and quickly available. We use our own data cloud in Switzerland and developed an easy to use hybrid application for the back office and the ski instructors,” said Claudio Hagmann, Head of IoT at Wuerth ITensis AG. TalkPool AB is an affiliated company of TalkPool AG, listed on NASDAQ First North. TalkPool AB enables the IoT ecosystem by providing professional services and solutions for Internet of Things. TalkPool’s offering in the IoT-market ranges from planning and building of IoT-networks, to strategic consulting regarding IoT-technologies and designing and integration of IoT-solutions and specific sensors. For more information, visit www.talkpool.com. Wuerth ITensis AG is a leading provider of IT services in the area of comprehensive Cloud & IoT solutions. Our customers rely on our high quality IT services and products, which are worldwide available via our cloud. Certified information security, maximum availability and worldwide network are the basis of our digital services. For more information, visit www.wuerth-itensis.com.